DARIEN BOOK AID PLAN Inc. This past Wednesday, my young English club was so excited to come to our meeting that we had to post a teacher guard at the library door to keep the stampede at bay. Despite our efforts, they couldn’t help but peek inside and point out the little strips of paper I was hiding throughout the room, their eager eyes wide and curious. I had told them that today was a very special day, because our school had received a present from the United States and we also had two guests from the United States who wanted to meet them. The "present" at the end of our quest. Little did they know, our present was a box of English books and our guests were another PCV and his uncle who was visiting for a few days. One of our honored guests, hard at work reading clues to English club for our book quest. But, no matter. I had to find a way to make books and native speakers exciting for a wild group of 9-12 year olds! I decided to make a little quest for the kids. After a brief introduction of our honored guests and a few questions from the suddenly shy students, they divided into pairs and I gave them each a clue. This clue led to another clue that was located near a certain section of the library. That clue led them to one of our guests who read them their next clue which in turn lead to a description of one of our new books. 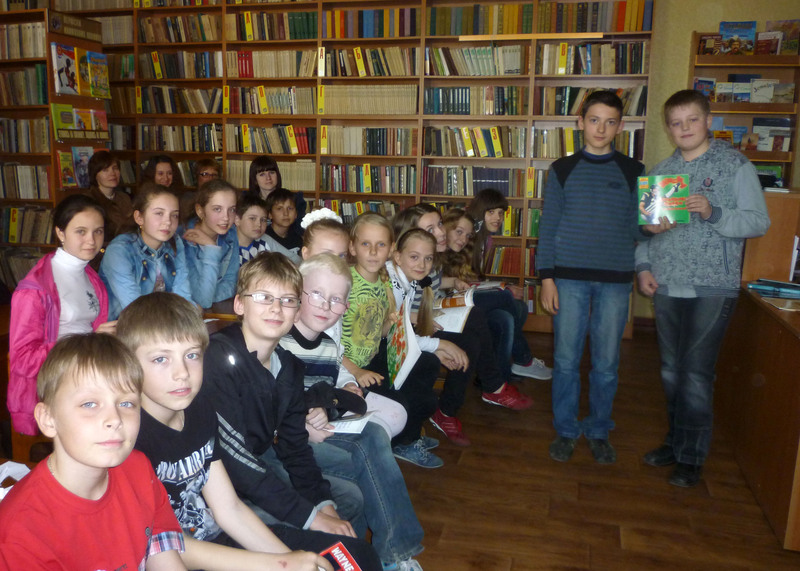 Once the kids found the correct book, they perused its contents and present it to the club. 6th Formers, Anton & Vasya, presenting a book about American 'football'. 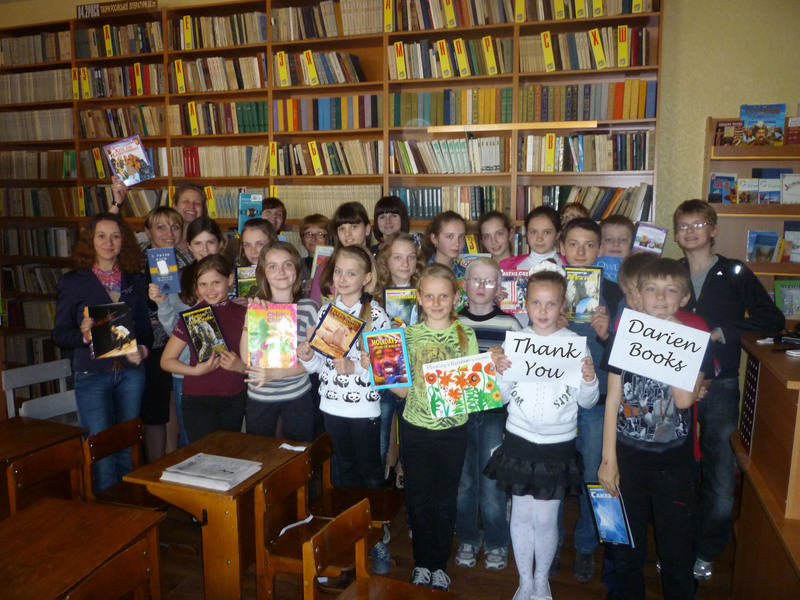 English Club with all the books we received from Darien Books! **I want to make a shout out to DARIEN BOOK AID PLAN Inc. This amazing organization collects, organizes, and ships 20 pounds of books, free of charge, to Peace Corps volunteers, libraries and schools all over the world. 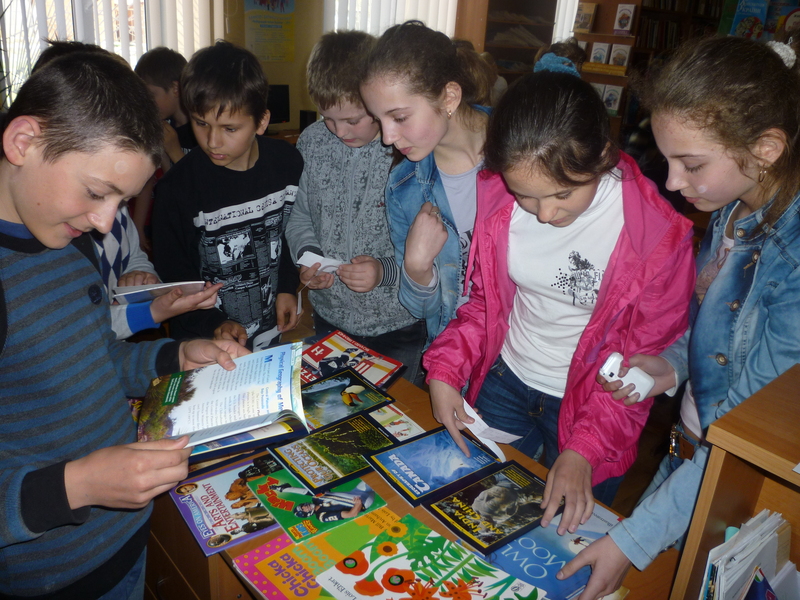 They even try to match specific requests such as books for young learners, classic novels or digital encyclopedias. Six months ago, I emailed them asking for a shipment of books, and they responded by sending a box, tightly packed with exactly the age and English ability level I asked for. Some of the books were even brand new and had interactive CDROMs attached.